Since my son Jonah and his family were off visiting his wife’s family this 4th of July, my beloved best friend’s niece, Angie Braddock, insisted that I go with her and her beau, none other than the sheriff of Holmes County James Mitchell to see fireworks. I told Angie that I didn’t mind spending time at home alone and quilting, but she wouldn't take no for an answer. She is a stubborn one just like her late aunt, my dear friend Eleanor. In the end, I went. There’s no arguing with Angie when she sets her mind to something. This trait can be annoying when it comes to fireworks, but it makes her an excellent detective when it comes to sleuthing murders. Don’t tell her sheriff I said that. He’s not too keen on Angie sleuthing. It’s a bit of a sticking point in their relationship. The fireworks were at the fairgrounds. Everyone was there including a lot of Amish people, both young and old. Angie and the sheriff brought lawn chairs for us to sit on and treated me as a special guest. They bought me popcorn and ice cream and even an Englisch treat called a Snow Cone. I was eating that Snow Cone when there was first crack in the sky. I nearly jumped out of my seat when the firework exploded. I may have suffered hearing loss, but after I recovered from the fright, I loved it. The colors, the flashes, the cheers at each explosion in the sky from what seemed like everyone in Holmes County. For a moment, it was like we weren’t divided into Englisch and Amish. We were one community enjoying a splendid summer night. I think Angie and the sheriff felt the same way, but I can’t be sure how many of the fireworks they saw since they kept stealing looks at each other. I do know Angie’s French bulldog, Oliver, didn’t agree with me. He hid underneath Angie’s chair during the fireworks with his ears over his paws. But Angie was right, I did enjoy myself and might be willing to give some more Englisch summer traditions a try. What are your favorite summer traditions? I'm looking for ideas. Summer is here! During June and July, Killer Characters is celebrating the Cozy Days of Summer by giving away a gift EVERY DAY. 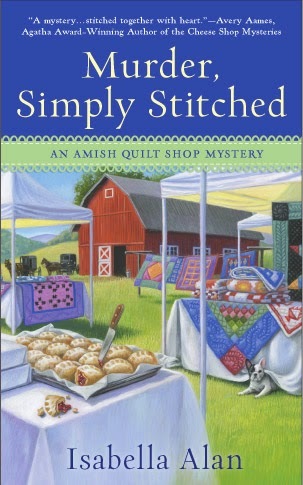 Today, you can win a copy of book one in the Amish Quilt Shop Series, MURDER, PLAIN AND SIMPLE. Just leave a comment answering Anna's question in the post before midnight — with your email address so we can reach you — to be entered in today's drawing for the book. Haha thats so funny because my little brother's birthday is on july 4th! One of my favorite summer traditions is all of the time I get to paint and draw and sculpt I really enjoy it! I've also started this tradition on my blog where every June, July, and August I give some interesting facts about the months. I also enjoy going to the nursery and getting plants! Not so much outdoor flowers though. Wher I live, it usually gets in the 100s in the summers! The flowers don't really stay alive when it's that hot. I hope I was helpful. Getting together with family more, eating watermelon, enjoying flowers growing in the garden and just getting outside more, breathing the fresh air and listening to birdsong. My favorite thing is my family has a bit of a reunion the weekend after the fourth of July. We have a pig pickin' as we call it. Everyone brings a dessert, a bit of competition there...fireworks to finish! A good time is had by all! I love seeing the fireworks and I love going to fairs. My favorite summer tradition is a regular one for the Amish-going to farmer's markets to buy the local produce and get fresh eggs. Growing up it was going to lawn fetes. I suspect that the dog had is paws over its ears, not the other way around! We usually try to get all six of our kids and their families together at our cabin, which is too tiny to house more than one or two of the families, so it is a real challenge. But the weather generally cooperates and everyone has a great time outside. Sometimes the tenters have gotten a bit damp. But we eat outside and mostly cook outside and swim and fish and have a family 5k race. Our fun times are coming up at the end of this month so I am praying for great weather again. Having a cook out with family. Cookouts and lots of family fun time. I love getting together with family and enjoying time outdoors. Good food and good company is what it's all about. When we lived closer to home it was family picnics and swimming. Love my mother-in-law's potato salad, my dad's cole slaw when he was still with us, hot dogs smothered in whatever I could find to throw on it, fruit salad or just plain watermelon, popsicles, corn on the cob and twist cones. Night fishing is an awesome summer activity! During the hot, hot days of summer, the fish laze on the cool bottom with no desire to swim up to the heated top to bite on a worm or a chicken liver. Kick back in your lawn chair with your pole propped on a rock, relax and enjoy the relief from a hot working day. Even if you're going to throw back your catch, you'll be rewarded with some of the best summer fun ever. So glad you enjoyed the fireworks Anna. Poor Oliver...he should've stayed at home :0(. Fireworks, ice cream and the county fair. I actually have plans to go to Ikea on the 4th of July! Maybe some plans with family over the rest of the weekend. And host a picnic for all who made our fruit such a hit! Lemonade Luncheons are a summer favorite along with ice cream socials. We also visit the graves of all family members and launch balloons to heaven. Thank you for the giveaway! I love swimming in the summer! My toddler really took to the water this year and it is awesome. Brooke, you won! Please email your snail mail address to authoramandaflower at gmail dot com for your book. 175th City of Galveston Celebration Independence Day Parade and Fireworks, Galveston TX. Cooking over open fires and lots of picnics. cook outs with friends, day trips with hubby, and of course, fireworks - the community kind, not individually purchased and set off - don't like those at all! Summer memories include fireworks and home made ice cream. My favorite summer memories are at the beach watching the sunset. Having yummy ice cream drip down the cone as quickly as you lick at it. Now as i get older its been relaxing at home with friends and a glass of wine. When I was a little girl, we used to get in our pi's and meet with the neighbor kids in their pi's. We'd get glass jars from our moms, and run around outside catching the fireflies. We did that until one day, my older sister tripped on her patriotic pi's and landed on her glass jar, while it was still in her hand. My brother and I ran in our backdoor and out the front door screaming, "She's dead! She's dead!" My mother flew downstairs wildly calling out, "Who's dead?" My sister came into the kitchen from the back door with blood splurging like Old Faithful. The blood covered the entire kitchen. Thank God our neighbor was a surgeon. Lately, I have seen that the kids can cut open those night sticks and pour them into a glass jar. As long as it stays on the tables outside, I am good. Otherwise, I may be yelling bloody murder once again, and I really do not want to do that! My favorite thing to do, however, is to get corn on the cob from only one place. There is no other place for us. It is called The Farm. A farmer used to farm the land where they now bring their food to sell. They still own it, but have since dwindled down to the farm land that is left. The rest of the area is now suburbia. They come in starting mid July, and we are there like vultures. I can tell you that I refuse to buy corn on the cob from anywhere else, unless I am purchasing directly from a farm, as I am now very spoiled. Hope your holiday is safe, and free from all of the craziness! I like to go to festivals and play bingo. I used to go to flea markets.